Don’t splurge on these items when Target has options that are just as stylish—sometimes even better!—at a fraction of the price. Target is spot on when it comes to trend forecasting. Even though the retailer is budget-friendly, their design pieces always seem to hit the mark in terms of style. While they have a very broad offering, Target should be your first stop for certain items. After all, mixing high and low elements is a crucial mission of any room. Whether you are in need of a lamp to lighten up your bedroom or a blanket to make it feel more cozy, Target has you covered. Unless you found the perfect vintage piece, there is no need to invest here. When you are simply looking for something to fill your shelves (and make them fun), don’t break the bank. These types of items can be yours for a cool $20. Style your surfaces with brass, wooden, and marble accents to get a healthy mix of materials. Target has some killer side tables. Every year, they blow our minds by coming up with something even more special than the season before. And at less than $100 each, you can swap them out annually. Yes, Target recently revealed a killer art assortment. This used to be one of the categories where they fell short, but those days are over. Now, you can get your apples and artwork from the same store. Truth be told, you can fill most of your lighting needs at Target. We’re currently drooling over their new desk lamp styles and suggest sitting them on your bedside table. Most are simple and incorporate a brass element. Sleep tight knowing that you only spent $40 on your find. We dare you to suggest a room in your house that wouldn’t benefit from some additional storage. When your space is busting at the seams, a woven basket is your best friend, and Target’s selection is spot on. And their low prices allow you to stock up for every room. There are a lot of expensive pillows out there. But if you’re designing a family focused space, this is not the place to splurge. Luckily, Target has you covered. Pro tip: The easiest way to snag your own perfect pillows is to shop their website by color. Are you trying to cozy up a forgotten corner of your home? Make sure Target is your first stop. They have dozens of styles in every texture imaginable. Chunky knit? Check! Much like kid’s clothes, kid’s décor isn’t the best place to invest. (Johnny isn’t going to like frogs forever, and Suzy won’t always want a stuffed swan hanging on her wall.) Just because they will soon move on doesn’t mean that you can’t put a couple bucks towards the design. Target makes it easy, especially with their Pillowfort line. If you’ve ever shopped around for geode bookends, you know they can be pretty pricey. Target offers a wide range of bookends that can match anyone’s style. So stock up on your brass, marble, and crystal cut objects, and upgrade your shelves. So you aren’t going to get the most glamorous mirror here, but not every space needs that. 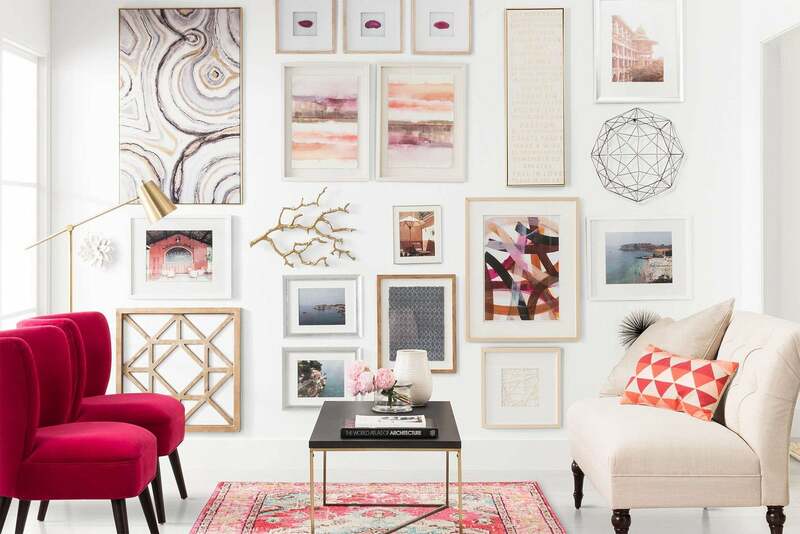 If your home requires something a little less luxe, head to the wall décor isle. Their simple styles are sure to work in any room. Yes, you read that right. Target has a great selection of poufs and ottomans. Add a pop of color in the form of functional seating to your living space. Frames—especially custom framing—are often expensive. It costs 30 cents to print a photo and $30 (at least) to frame it. Instead, let Target save your special family memories. With prices this good, you’ll find yourself scrolling through your phone for pictures to print. Looking for a special container for your spring blooms? Sick of storing them in a drinking glass? Get yourself to your local Target—the options are so, so good.